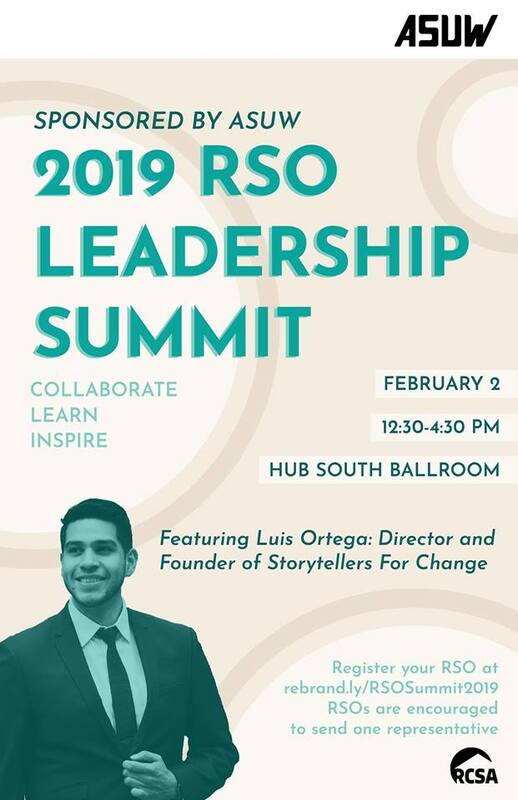 Saturday, Feb. 2, 2019, 12:30 – 4:30 p.m.
Take inspiration from leading keynote speakers and RSO leaders, connect with ASUW leaders and teams, and collaborate with like minded leaders to take home new ideas, insights, and techniques to enhance your RSO! All RSO’s are strongly encouraged to send one individual as a representative. This one day thought leadership conference will feature experts in event planning, fundraising, and team organization, who will discuss the challenges and opportunities RSO’s face within UW. In addition, you will explore how to achieve your RSO’s goals now and in the future.